If you wonder why Ski-Doo sells more snowmobiles than any other sled maker, consider your choices in the stretch track “130” category. You can get a 2016 Renegade Adrenaline with the on/off trail 137-inch Ripsaw track with either two-stroke or four-stroke power. Yes, they are different, but not that different. The Rotax 600 E-TEC slots into the 130 hp class easily and is favored by traditionalists who won’t give up their two-strokes. The newly updated Rotax 1200 4TEC actually causes us problems as we’ve had to rethink which of the two “130” Renegades we’d want. Prior to Ski-Doo’s decision bringing the all-new for 2016 Rotax 1200 4TEC into line with the same multiple driving modes as its popular 600 and 900 ACE four-strokes, the 1200 4TEC would have been a definitive second choice versus the direct injection 600 E-TEC. Now, though, aside from the added weight of the four-stroke triple compared to the two-stroke twin, the 1200 4TEC powered Renegade Adrenaline offers a bit more power to offset its additional weight and its throttle by wire ease of operation adds a barely felt throttle pull and a choice of engine modes. The nifty direct injection 600 E-TEC offers a light throttle pull, but not as light as the 4TEC. Plus, you can change to one of three performance modes with the four-stroker: sport, standard or economy. Revised for model year 2016, Ski-Doo’s new 1200 4TEC triple features multiple driving modes and a bit of extra “juice” for on- and off-trail riding. Three engine mode choices won’t be the big reason for choosing the 1200 4TEC Adrenaline over the 600 E-TEC. Ski-Doo needed more than that to get this two-stroke junkie to reconsider our feelings about the 4TEC Adrenaline. While we would rarely, if ever, switch the 4TEC into ECO mode, we could and it would mark total desperation on our part to squeeze out mileage to get home because we missed a fuel stop. We would switch between the sport and base modes. While we prefer the standard setting for its smoother engagement and run-up from drive off to top end, we might change into sport mode for off trail or aggressive on trail riding where we want unrestricted performance. However, in our annual testing session where we have opportunities to ride the competitions’ models, we noted that Yamaha, which reworked its 1049cc Vector and Venture triples with a similar multiple-mode capability, added a compensatory setting to reduce the herky-jerky throttle you get with the Rotax in sport mode. These computerized throttle settings are extremely sensitive if you ride over bumpy terrain and don’t have the throttle pushed to the handlebar all the time. You get a jerky on and off sensation through the throttle. The 4TEC’s base mode mitigates that response, but Yamaha’s chip control throttle programming went one step better, adding in a “pause” action in the control module that actually smooths out any erratic throttle thumb moves you might make in rough terrain while in Sport mode. You easily recognize the difference when switching from one brand to the other. The Renegade series is all about not having to choose between a pure trail sport sled and an off trail sled, but choosing whether to power your 2016 Renegade Adrenaline with a 600 ETEC or 1200 4TEC will be harder than you might think. But, that’s a minor detail when choosing between two-stroke or four-stroke power in the 2016 Renegade Adrenaline. As noted, we are two-stroke junkies and the advantages in this year’s Adrenaline can be felt from the first ride. Obviously they sound different. The 600 E-TEC is a high revving two-stroke that provides the sound and feel traditional snowmobilers love. It revs to 8100 rpm for peak horsepower, engages its TRA VIII and QRS clutches at 3400 rpm for drive away. Its peak torque comes in at 7900 revs. The ETEC is decidedly lighter; chalk that up to one less cylinder and the relative simplicity of two-stroke function versus the 4TEC’s dual overhead cams and such. 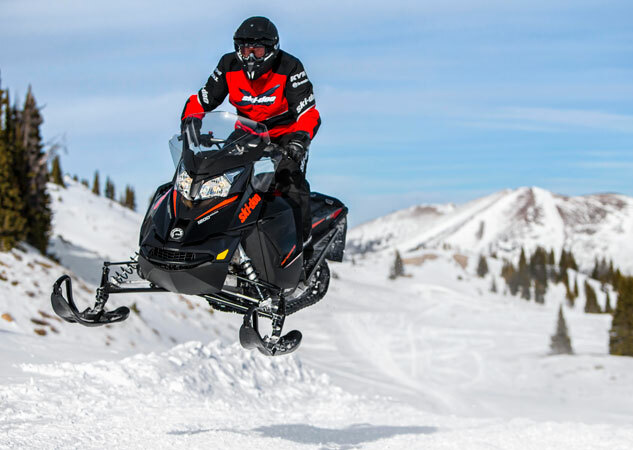 According to Ski-Doo the two Adrenalines, while similar in appearance and equipment, vary in total weight by about 50 pounds – 600 ETEC weighing at 477 lbs versus the 1200 4TEC at 528 lbs. While Ski-Doo is not free with horsepower figures, from what we gather the 600 ETEC will deliver about 10 hp less than the 4TEC. Using our basic math skills, we can deduce that the power to weight ratios of the two sleds will be virtually identical. There is no weight or power advantage between the 600 E-TEC Renegade Adrenaline and its four-stroke sibling. Ski-Doo’s 1200 4TEC Renegade Adrenaline offers virtually the same power to weight ratio as the 600cc E-TEC version. You will also note that chassis-wise, for model year 2016 the two sleds share the same REV-XS platform. Previously all 1200-engined models used the slightly wider REV-XR platform. Moving the 1200 4TEC to the XS chassis required designing an entirely new, more compact and lighter exhaust canister to allow the entire package to fit into the same space as the 600 ETEC. Traditional two-stroke riders will enjoy the proven performance of Ski-Doo’s direct injection technology. We are not going to argue that the two sleds “feel” the same on the trail. The 4TEC does have that extra cylinder and engine weight behind the skis and it can be felt if you pound the 1200 Adrenaline over big bumps all day. The 600 ETEC will be lighter through the handlebars. You’ll also notice that overall performance in those conditions will be different as well since the clutching set ups are totally different. The 600 ETEC features a proven TRA III driver with QRS driven. The four-stroke 1200 4TEC uses Ski-Doo’s latest eDrive2 with the matched QRS. Expect good performance from both, but we found the standard two-stroke setup reacted a bit quicker off trail. The eDrive2 setup works better and more smoothly for sport riding on groomed trails and occasional off-trail forays. Other than drive systems and your personal feelings regarding two-stroke power versus four-stroke power, these 2016 Renegade Adrenalines match up well. Granted that the shock packages appear the same, but expect that Ski-Doo engineering compensated for differences between the two models. Up front you’ll find HPG Plus shocks controlling the RAS2 suspension’s 9 inches of total travel. The Adrenaline models offer base Pilot 5.7 skis rather than the latest adjustable ones. The rMotion's rear suspension is very good and easily tunable for on- and off-trail riding. It offers 16 inches of total travel range controlled with high-pressure gas shocks. With up to 16 inches of travel, the rMotion suspension features high-pressure gas shocks. Each of these Adrenaline models offers standard electric start and reverse. The 600 ETEC features the Ski-Doo/Rotax pioneered push button electronic reverse and there is a conventional mechanical reverse on the 1200 4TEC four-stroke. The standard REV-XP X seat offers exceptional room, plus much appreciated rear storage. The multi-function gauge comes standard, as does an aluminum handlebar with J-hook ends. Rear seat storage is a much-appreciated benefit of the Renegade’s REV-XP X seat. Overall, as more of an occasional off-trail rider who likes to venture into adjacent unbroken snow fields or throw up snow across a long lake, we’d seriously consider the Renegade Adrenaline 1200 4TEC simply for its smooth on-trail characteristics, its quieter under hood feedback and its four-stroke torque feel that easily transitions from drive off to midrange. We haven’t given up on two-strokes, although Ski-Doo’s engine developers make the differences more minute ever season. We still like the intangibles and heritage of the two-stroke, especially the ones we get with this unique direct injection Rotax. It revs a little higher, engages a little higher at drive offs, but screams at top end like only a performance two-stroke can. Makes no sense, right? Well, we are conflicted when it comes to choosing between these two Renegades. We like them both, although for different reasons. This is why Ski-Doo leads the sales parade. This snowmobile manufacturer offers two similar but distinctive choices within the same basic “130” category letting you have it your way.